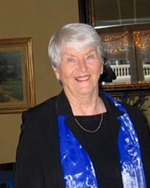 Marcelline Burns, PhD, spent thirty years as a research psychologist. She retired at the end of 2003 and now explores the vast possibilities of leisure time. She lives at the beach, and finds daily spiritual sustenance with family and friends, books, and walks beside the sea. She travels to remote locations, and feels blessed to experience the wonder of this earth and its animals and peoples. With ever so slight a sense of regret, she acknowledges that there are more magical places to visit than time will allow.